Stylistically, Blade Runner is a masterpiece…the look, the sound, the story. It’s science fiction meets film noir. 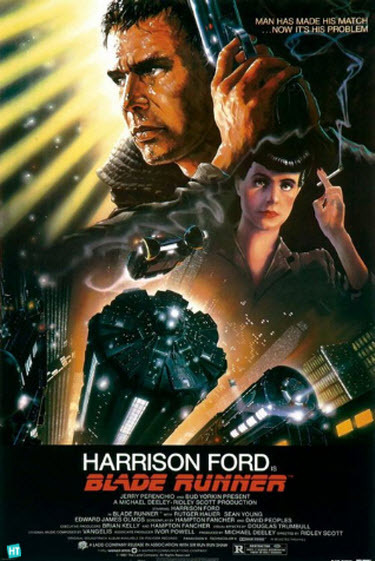 Set in an environmentally ruined earth, Rick Deckard (the Blade Runner) is tasked to find and kill four bioengineered robots called “replicants.” The problem is, the replicants look exactly like humans. While being hunted, the replicants are on a hunt of their own…for their creator. They have questions, “Why were we created,” and “Why do we have to die?’ They question what it is to be human. The setting and the story are believable and perhaps even prophetic. This entry was posted on Friday, September 30th, 2011 at 3:00 am	and is filed under A Bowl of Popcorn, a Movie and Thou (Movies). You can follow any responses to this entry through the RSS 2.0 feed. You can leave a response, or trackback from your own site. One Response to " Blade Runner"
I loved that movie, but it’s been ages since I’ve seen it!